PacWrap Complete System 16", 27", 32", 42"
For videos, gift baskets, posters, picture frames, and companion packaging. 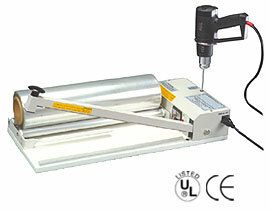 A Complete set includes a PW bar sealer, PW heat gun, PW shrink film. For high volume shrink wrap needs. Optional features: Magnetic Hold Down, Roller Take Away Conveyor, Film Perforator. The AIE line of L-Bar Sealer Shrink Wrap System provides the user the ability to produce products that have a factory-fresh clean look and feel. These L-Bar systems can create packages that are free of dust, moisture and fingerprints regardless of shape. Discourage tampering and shoplifting. 1. Cut and seals sharp, clean and extremely fast. 3. All steel construction for heavy duty use. 4. Adjustable film dispenser rack with smooth bearing rollers. 5. 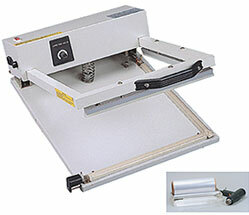 Twin perforating hole punchers and film guides. 6. Film separator and work table. Model Sizes: 18 " x 18 " and 24 " x 32 "
1. Heating on 4 sides. 10 infrared replaceable tubes. 2. Adjustable speed conveyor up to 20 ft. per minute. 3. Separate adjustable temperature controllers for upper and lower heaters. 5. Optional Teflon mesh conveyor belt. Application: Food, books, toys, stationery, drugs, parts, hardware, video tape, All shrink wrap. An excellent addition to I-bar & L-bar Shrink systems. 220 Volts. Max. Circum 20 " 32 " 44 " 60 "
3 Piece Kit (1 Heating Elements, 1 Upper Teflon & 1 Lower Teflon) for All Type I-Bar Sealers. *K1313L-6 Piece Kit (2 Heating Elements, 2 Upper Teflon & 2 Lower Teflon).